When it comes to chocolate bars with a 100% cocoa content, there seem to be two types--at least from what I have observed. The first 100% bar I ever had was from Pralus and I loved it (that was so long ago that I'm curious to try it again and see what I would think now). I've had others that I've liked and others that I haven't. I hated the one from Bonnat. The difference between the Pralus bar and the Bonnat bar is what I meant when I said that there were two types: the first was dominated by chocolate flavor and the second by cocoa bitterness. Chocolate flavor can be either straight chocolate or various flavor notes. Either way, it's distinct from the biting bitterness experience. The Haiti 100% Cacao bar falls more under the category of the Bonnat bar. Its scent is deep and felt slightly floral to me, but perhaps that was just how I was registering the high cocoa content. An initial bitterness on the tongue builds and increases, only decreasing and mellowing a bit around the halfway point. It is important to note that with a chocolate that only has cocoa in it (no sugar, no nothing, just cocoa and some more cocoa butter), it can be helpful to start with a much smaller piece than what you would normally consider. A bigger piece will mean more bitterness. A smaller piece will mean that it's easier to take in. Still, you get my point: this chocolate wasn't for me. I don't mind a certain degree of bitterness in chocolate, the kind that teases around the edges. I don't mind very dark chocolate: I've loved certain bars in the 80's, 90's, and even 100% ranges. But this one just isn't my style. Back in November, I did review the Haiti 70% bar (and of course yesterday I reviewed the Haiti Milk Chocolate). 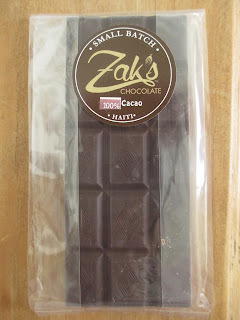 That chocolate was one of my favorites from Zak's, which is what makes me surprised that the darker version didn't work for me. Maybe because I described it then as being "featherlight" and a 100% bar, by its nature, can't really be featherlight. (Interestingly, too, I also described that bar as having floral notes to its aroma but not its taste.) 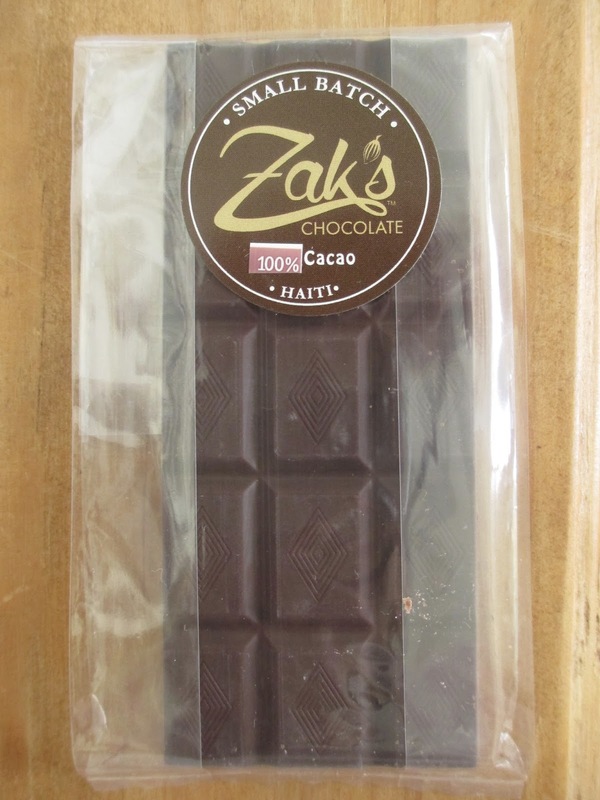 So having tried three versions of Haiti origin chocolate from Zak's, the 70% remains my personal favorite.